I made it when I was 10 years old and It toke me a week without playing with my friends. I just got inspired and wanted to build something like the pictures in my father's Art History books. 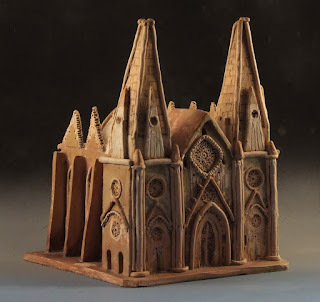 This church represents the beginning of my passion for sculpting. I learned a lot that day not only about ceramics but engineering also, I had to make internal supports to hold the roof and cut angles to get the pointy shape. The picture is my first attend to shot something more in fancy way.